Much has been written about Jon Bergmann’s movement around flipping the classroom. Digital learning is more about flipping the teacher. As illustrated above, traditional education is centered around the expert delivering information to a large group. In this setting, the teacher speaks to large groups up to 80-90% of the time and less than 20% of the time working with small groups. In digital settings, the teacher becomes small group focused, working with individuals and small groups 80-90% of the time and in large group settings for the balance. This is more than being a “guide on the side.” The digital teacher provides detailed focused instruction to help students with basics, for clarity, and for extension of the fundamental learning. The teacher’s role becomes flipped. So the forecasts and calls for competency based instruction and personalized learning need to focus on flipping the instructional perspectives and roles of the teachers. This is more than flipping any classroom; it is flipping the teacher. 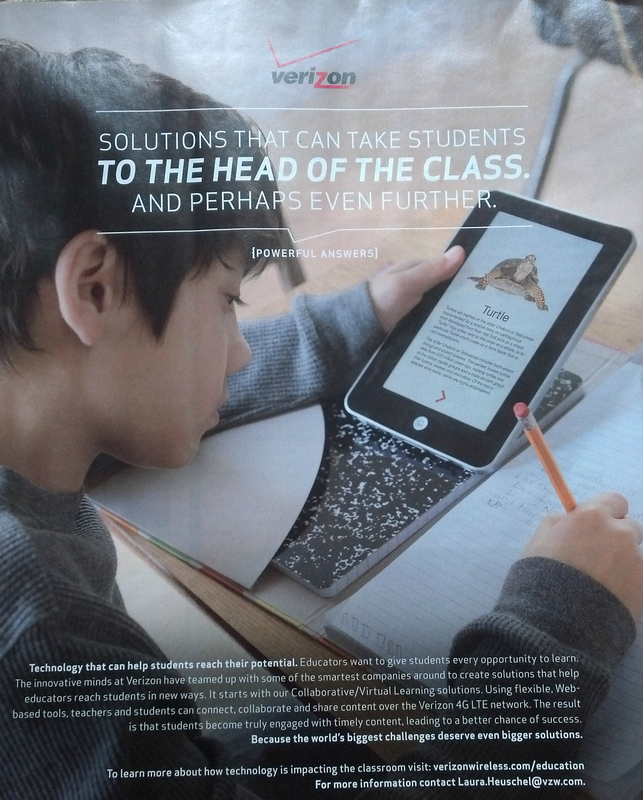 Recently, the advertisement above appeared in a national educational technology magazine. I sent out a tweet, asking “Why would I want do this in my classroom?” One response was, “You’re looking to create ICE in the classroom! Independence, Challenge, Engagement! Differentiated classroom with open objectives.” I replied that I could do that with a book. This is what “technology integration” looks like. Doing the same activities with new objects. Further why are we asking the student to convert digital content to analog content? My guess is the student is completing a worksheet or “taking notes,” moving information from one place to another (Jamie McKenzie). How did this hardware get there? My standing hypothesis is that it’s not curriculum-related. Some “influencer” attended a conference or other presentation, returned, and stated that “we have to do that.” “Our students will be behind if we do not do that.” Peer pressure from other districts forced action. The equipment was purchased, teachers were shown the switches, buttons and a few “apps.” They were asked to brainstorm how to use the gear, asked to make a lesson, and sent back to their classrooms to “integrate the technology into their classrooms.” There will be little results related to student learning. There will be an assorted discussion about student “engagement” and “use of technology.” Little or nothing about student performance and achievement. What should students know and do? How will we know they understand and can do? What instructional strategies will we use? What hardware and software will we use to support the strategies, student learning, and student assessment? So until we get thoughtful leadership in our schools that quits talking about “technology as a tool” or “technology integration,” learning in school with hardware and software will be stuck in an infinite loop! Many digital citizenship programs focus on digital citizenship with students with a list of “don’ts.” The ideas below look at positive and proactive steps to consider citizenship issues with students. In recent years, many blue ribbon committees have called for changes in schools to prepare children for their futures. Globalization, competition, and new economies are dictating expectations to our schools. The proliferation of new technologies allows students to communicate and collaborate with their peers. While schools grapple with the implications of social networking, instant messaging, and cell phones, students need guidance from adults to use these power learning opportunities in appropriate ways. In some cases schools need to intervene because students use technologies inappropriately. Many professional societies, including the American Association of School Librarians (AASL), the Consortium for School Networking (CoSN), and the International Society for Technology in Education (ISTE), provide standards and goals for the implementation of technology in learning. These standards include information literacy, collaboration, communication, and digital citizenship, among others. This guide is to further focus on digital citizenship. Entries on social networking web sites, in microblogging networks, and in digital video collections are virtually permanent records of students’ lives. A mistaken entry made as a teenage could negatively affect college acceptance, employment opportunities, or even future friendships. It is essential that students manage their traditional reputations as well as their screen reputations. Having multiple identities on the Internet may be unwarranted and confusing. 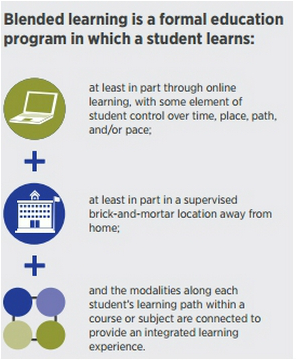 As students develop digital proficiencies, maturity and independence, their screen activities are likely to increase. Part of managing a screen reputation is with a single identity (screen name). This screen name can manage educational achievements and personal connections. With a single screen identity, students should closely manage what they add to Internet sites as well as routinely checking search engines for their names to determine what is posted by others about them. Meanwhile, students should manage their digital safety as strongly as they manage their personal safety each day. Post only information that will not reveal home addresses, telephone numbers, date of birth, parents’ names, siblings’ names, and other information that could make a student a target. This also means that students should never post provocative pictures of themselves, send such pictures through texting, or other means of sharing. With digital technologies, students can easily share information and photos on social networking sites, phone texting, and peer-to-peer sharing. While this possible, students should think whether this should be done. Like personal information, never share another individual’s personal information without permission. With photos, it’s best not to share them without permission of those in the group. Certainly, it is not appropriate to share a photograph of others that may be embarrassing or put them into a position to explain their actions to others. When unsure, ask for permission to share. Forwarding embarrassing photographs, text messages, or email communication damages relationships is easy with digital technologies. Resist the urge to share any information that might damage friendships or family relationships, or hurt others. Common sense should tell students not to share anything about others without permission. Across the world, prosperity is gauged by ownership whether it be homes, office buildings, money, herds of animals, or publication of ideas. Attitudes and laws have been developed about ownership of ideas expressed through writing, art, and music. In learning environments, scholars give credit to other scholars through citations and attribution. When ideas are quoted directly or paraphrased, the original scholar is given credit. Additionally, scholars, artists, and musicians earn their incomes on selling their work. Respect that work by purchasing legal copies. Do not share your copy with others as it deprives the creator from payment. with great care. Computers, printers, and networks are expensive to install and maintain. Share your computer time with others who are waiting. Print only what you really need. Maintain your personal storage devices, such as usb drives, so they are virus free. Refrain from installing viruses or key loggers on computers. In many states, computer hacking and other digital intrusions are serious crimes. Regardless of a school’s view of technology applications, viewing citizenship activities as positive measures provides forward-thinking ways to apply important standards for students. Techcon occurred October 26, 2012 at the Naperville Campus of Northern Illinois University. Over 160 local school administrators, technology leaders, and classroom teachers convened for the one-day session. Google’s Jaime Casap (Twitter: @jcasap) was the keynote speaker. His presentation focused on the crisis of low expectations and that even though the jobs that will exist in 2037 are not known today, several skills exists today that are fundamental to success years away: communication, collaboration, critical thinking, analyzing information, and problem solving. He noted that we learn and solve problems in different ways so we should have different types of assessment. Further students today have new capabilities to learn differently and that education is beginning to take advantage of new learning models. With one of the themes of the conference was about cloud resources, sessions addressed the Illinicloud, and Google, Apple, and Microsoft cloud offerings. Other sessions outlined digital learning opportunities, a 1:1 implementation, digital mapping, Open Education Resources, and social networking applications in schools. Apple’s Patrick Beedles (Twitter: @beedles_apple) closed the day with a summary of the day’s key points. This day-long program is a strong collaboration of the Illinois Association of School Business Officials , the Illinois Computing Educators, and the Illinois Chief Technology Officers. Next year’s conference is at the same location on October 18, 2013.